Grenson has enjoyed a long history in British shoemaking dating back to the 19th century. From design sketches to final production, each and every pair of Grenson shoes is crafted in the same factory in Northamptonshire, using the traditional Goodyear Welting method. The detailed and intricate processes take several weeks to complete, but the final result is an expertly produced shoe which is engineered for durability. Grenson has recently stepped out again into the women’s footwear market, offering a range of stunning design finishes on shearling ankle boots, fringed loafers and mirrored leather brogues. Grenson has been producing shoes for over 150 years. It takes 8 weeks to produce each pair of shoes. The range is now stocked by Harrods and Selfridges. All shoes are produced exclusively in the Grenson factory. Grenson recently launched their first overseas store in New York. The story of Grenson began in 1874 when a 4-year-old William Green first moved to Northampton, England. Times were difficult for the Green family after William’s father passed away tragically young, and William worked in the shoe industry from just a child to help support his family. By the turn of the 20th Century, he had formed his own footwear company which originally went under the name of ‘William Green & Son’. The pioneering factory was one of the very first to use the Goodyear Welting technique of shoe production, and they went on to produce thousands of military boots for the British soldiers during The Great War. Following William’s death, the brand evolved into the simpler abbreviation ‘Grenson’ which was actually the first ever business name to be registered in the UK. Grenson faced tough times over the next few decades, as cheap low-quality imitations from overseas became widely available and consumers seemed to lose interest in the real deal. Tim Little took over as creative director from 2011, charged with the mission of reaching out to a new generation who have not experienced the true quality of a real pair of Grenson shoes and who weren’t aware of the benefits of expert craftmanship over cut-price fakes. The re-launch of Grenson is proving to be an incredible success with new stores opening up in New York, Soho, and Bloomsbury. SHEARLING AND SUEDE ANKLE BOOTS: Handcrafted ankle boots in natural color with cream panel and commando sole. CLARA HI-SHINE LEATHER LOAFERS: Stylish loafers crafted from glossy shine rub-off leather, with chunky wedge platform and exquisite fringe decorations. FRINGED LEATHER LOAFERS: Produced from white cut-out leather with fringe detailing and notched vamp. METALLIC MIRRORED BROGUES: Gorgeous fringed brogues crafted from silver-tone mirrored leather. LEATHER SUEDE SNEAKERS: Leather-trimmed low-top suede sneakers in pink with dramatically contrasting trims. TV presenter Holly Willoughby caused fans to go wild during her debut in the jungle on massive hit show “I’m a Celebrity, Get Me Out Of Here!”. 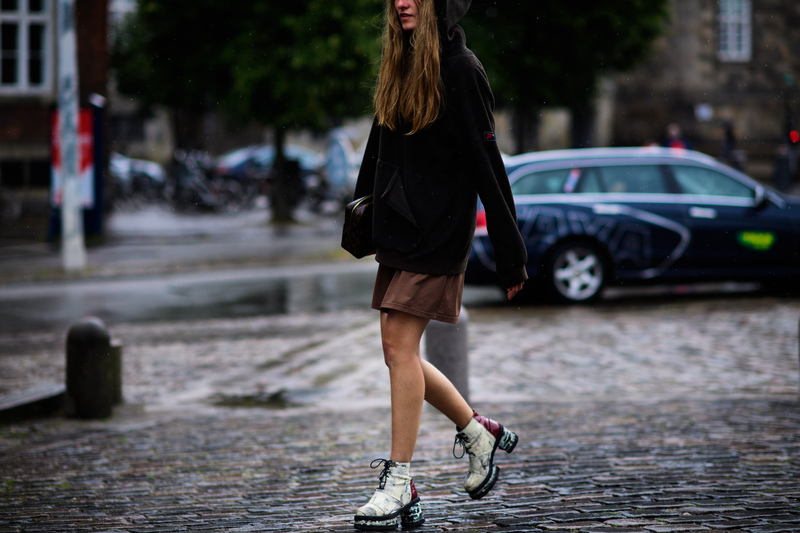 Holly was wearing Grenson hiking boots and generated huge demand for the footwear which promptly sold out. Hailey Baldwin was also spotted in Grenson boots while stepping out for breakfast with future husband Justin Bieber. Pixie Lott has been snapped in Grenson Clara leather loafers, while Cheryl Tweedy was wearing Grenson Emily shoes in a recent photo shoot. AGL ATTILIO GIUSTI LEOMBRUNI: Italy’s best kept secret audience has now been discovered by an international audience for the first time. IRO: The freshest footwear from IRO includes chunky low-top trainers, pointed knee-high boots and leather pumps. BOEMOS: Every pair of Boemos is built on the principles of long-term durability and total comfort. KENNEL & SCHMENGER: Shoes for fashion-forward footwear lovers who refuse to compromise on quality or style. CASADEI: The latest footwear collections from Casadei take retro inspiration from the glam styles of the ‘80s and ‘90s.